2019 Baseball/Softball Sourcebook 8 www.sportseventsmagazine.com In 2017, participation grew 6 percent overall, according to the SFIA Trend Report. About 2.4 million boys and girls ages 4 to 16 play Little League baseball and softball at all levels across the U.S. and in more than 80 countries. 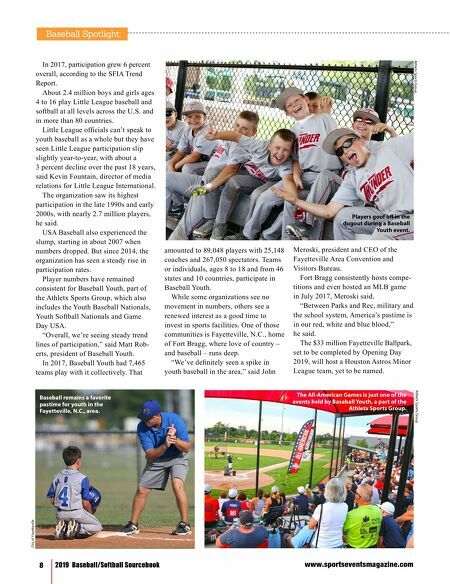 Little League officials can't speak to youth baseball as a whole but they have seen Little League participation slip slightly year-to-year, with about a 3 percent decline over the past 18 years, said Kevin Fountain, director of media relations for Little League International. The organization saw its highest participation in the late 1990s and early 2000s, with nearly 2.7 million players, he said. USA Baseball also experienced the slump, starting in about 2007 when numbers dropped. But since 2014, the organization has seen a steady rise in participation rates. Player numbers have remained consistent for Baseball Youth, part of the Athletx Sports Group, which also includes the Youth Baseball Nationals, Youth Softball Nationals and Game Day USA. "Overall, we're seeing steady trend lines of participation," said Matt Rob- erts, president of Baseball Youth. In 2017, Baseball Youth had 7,465 teams play with it collectively. That amounted to 89,048 players with 25,148 coaches and 267,050 spectators. Teams or individuals, ages 8 to 18 and from 46 states and 10 countries, participate in Baseball Youth. While some organizations see no movement in numbers, others see a renewed interest as a good time to invest in sports facilities. One of those communities is Fayetteville, N.C., home of Fort Bragg, where love of country – and baseball – runs deep. 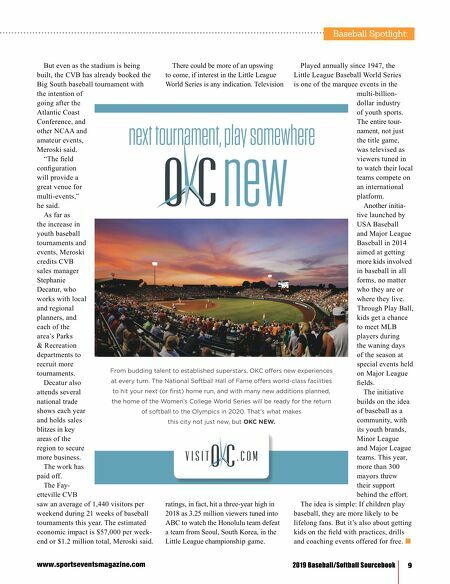 "We've definitely seen a spike in youth baseball in the area," said John Meroski, president and CEO of the Fayetteville Area Convention and Visitors Bureau. Fort Bragg consistently hosts compe- titions and even hosted an MLB game in July 2017, Meroski said. "Between Parks and Rec, military and the school system, America's pastime is in our red, white and blue blood," he said. The $33 million Fayetteville Ballpark, set to be completed by Opening Day 2019, will host a Houston Astros Minor League team, yet to be named. Baseball Spotlight: Athletx Sports Group Players goof off in the dugout during a Baseball Youth event. The All-American Games is just one of the events held by Baseball Youth, a part of the Athletx Sports Group. Athletx Sports Group City of FayeƩeville Baseball remains a favorite pastime for youth in the Fayetteville, N.C., area.